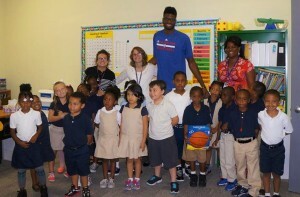 NBA star Nerlens Noel spends Tuesday morning at Douglass Academy! 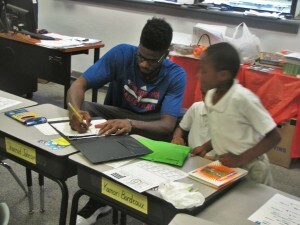 You are here: Home » Blog » NBA star Nerlens Noel spends Tuesday morning at Douglass Academy! September 23, 2014Blog, Events, Headlines, News & Updates, Press ReleaseComments Off on NBA star Nerlens Noel spends Tuesday morning at Douglass Academy! Wilmington- Tuesday morning, students at Douglass Academy received a huge surprise—literally— as they were greeted by 6’11” NBA star Nerlens Noel. Nerlens plays for the Philadelphia 76ers, having been a 2013 first round draft pick. At age 20, Nerlens was the sixth draft pick overall and starred previously for the University of Kentucky Wildcats. As a fellow basketball phenom, kindergartener Josiah Brown was particularly thrilled to meet Nerlens. Josiah, who at age five has received state and national coverage of his prodigious basketball skills, received a signed official NBA basketball from Nerlens. In addition to this—and a great deal of excitement—Nerlens provided laughs, autographs, photographs, great advice, help with classwork, and inspiration. During his visit, Nerlens was a classmate, reading partner, high-five giver, and buddy to all Douglass students. Nerlens was also able to personally thank D ouglass parent, Mary Donnell, for her donation of a basketball goal to the school. Nerlens’ basketball career offers living proof that her generous gift could directly influence the opportunities and future of Douglass Academy students. His example, along with Douglass Academy’s focus on character and academic success, will likely benefit all students for years to come. Nerlens visited the school at the special request of his friend John J. Ferrante, Esq., Chairman of the Board of the school.